Chess Tiger is one of the strongest chess programs in the world. It has been rated as the world's strongest chess program TWICE. Now it is available for the iPhone®, iPad® and iPod touch®. Chess Tiger is both a partner and an opponent able to adapt to your strength and help you to improve your chess... Everywhere! 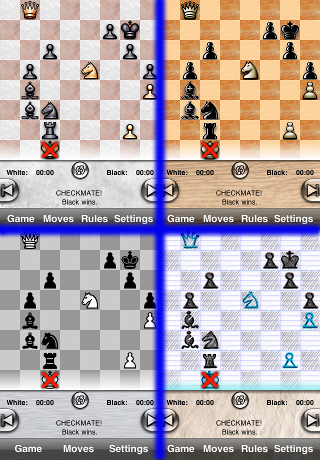 The rules of chess are included and easily accessible for reference. Just tap on a piece and the program shows you its legal moves. 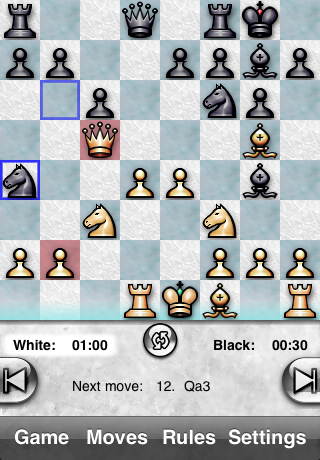 28 trainer levels of increasing difficulty designed to improve your chess skills are provided. 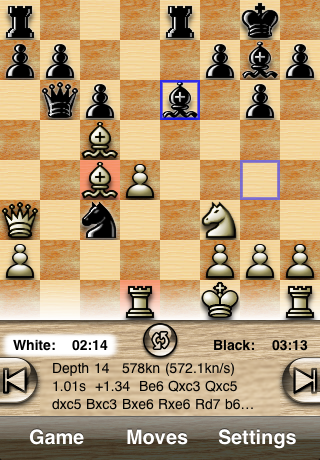 The chess engine is of very high quality, the guarantee to learn from a good professor. Naturally Chess Tiger knows and applies perfectly all the official rules of chess. Chess Tiger can play with you and suggest up to 4 safe moves. You decide which one to play depending on your own style. Or you can just play any other move you like! Both USCF and FIDE rating scales are supported. 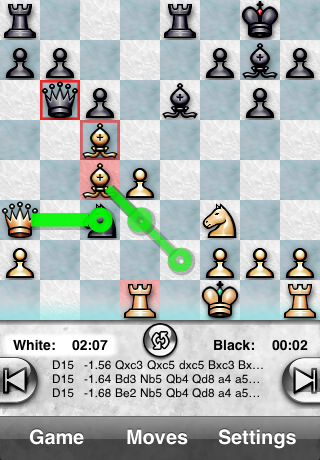 Chess Tiger is currently one of the strongest chess engines for mobile devices: it is optimized for 32 bits mobile processors. On recent devices it reaches a level close to 2700 elo (grandmaster). Chess Tiger has been ranked twice as the number one chess engine on the SSDF list (the worldwide recognized and independent computer's rating list). Chess Tiger running on a modest PIII-866MHz PC has achieved an historical Grand Master Norm in Argentina back in July 2001 during an official tournament, beating one International Master and four Grand Masters in a row, resulting in the astounding performance of 2788 Elo!!! You can save your games in collections and replay them later. You can exchange games with your friends very easily by email (both for sending and receiving). The chess engine displays its thinking, up to 20 plies ahead. You can analyze a game by replaying it. Chess Tiger tells you when a bad move has been played by coloring it in red, and show you the good ones in green. 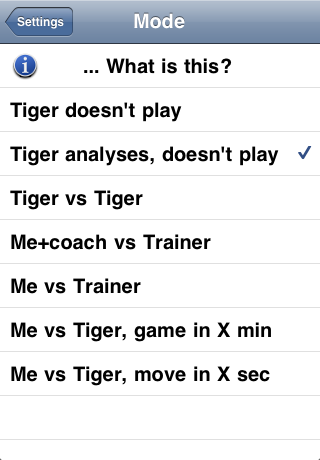 Chess Tiger supports variations and allows you to test "What if..." scenarios without erasing your current game. High Definition graphics on iPhone 4 and iPod touch 4, antialiased soft graphics for all the other devices. 12 gorgeous predefined visual themes that you can also customize. "Reload last game" allows you to retrieve the most recent game, even if you have forgotten to save it. 4 different playing styles, ranging from the quiet to suicidal, which you can apply to all the levels. Includes an opening book of more than one million moves. And it can be turned off. Many customization options (graphics, sounds, engine output…).